In our last post we mentioned the double breasted suit for summer. The Prince of Wales, Prince Charles, is a staunch supporter of the elegant double breasted suit. He was recently spotted sporting several summer-friendly styles, on visits to Cornwall, and we think the boutonniere is a particularly nice touch. We are big fans of the style at Henry Herbert. You may remember our December 2012 “DB-day – The Campaign to Wear the Double Breasted Suit“. There is no bad time to be sporting a double breasted suit, and in fact, the summer is a great time to show one off. Double-breasted jackets have their origins in English sportswear and the classic double-breasted jacket originated with the frock coat, worn in the early Victorian era, in the 1820?s and 30?s. Most double-breasted suits have two rows of buttons, three on each side. The middle button on the left is usually buttoned, as is the inner button, called the jigger button, which keeps the jacket flaps in line. Double breasted jackets are more complex in their construction than a single breasted jacket, but we feel the results are worth the effort! Just ask a Henry Herbert tailor, who will happily guide you through the details and differences. 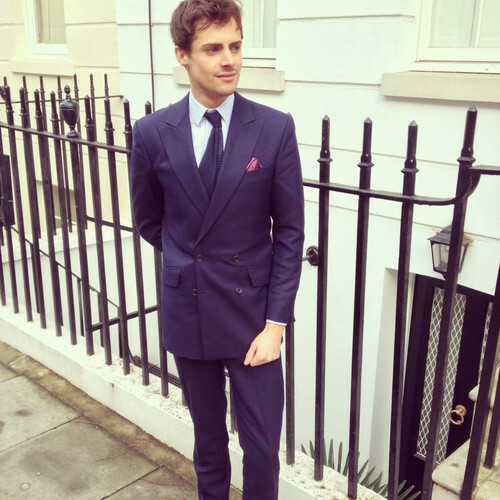 Great British Bespoke: Double Breasted Suits for Summer - Bespoke Suits By Savile Row Tailors.